Tag line: "The amazing global journey of the Cowboy"
Thanks to John Wayne, Randolph Scott, Roy Rogers, Clint Eastwood, Lee Van Cleef, and a slew of others, the cowboy has become an icon of the American West. But as the 2006 IMAX film Ride Around the World shows us, things like trotting through the plains on horseback, running cattle, even saddles and stirrups were around a thousand years before Hollywood started making movies, and well before the United States of America was born. It’s a profession that dates back to ancient Morocco, when cavalry soldiers, whose horses had rudimentary saddles and flat stirrups, roamed the outskirts of the Sahara Desert (a ride recreated for us here, as part of a modern wedding celebration). When the Moroccans conquered Spain in the 700’s, they brought with them their equestrian prowess (the Spanish Vaqueros copied their technique while running cattle). In the 1500s, when Spanish conquistadors landed in Mexico, they introduced that country to their unique horse riding skills, and thus the Mexican Charro was born. From there, it was short hop into Texas. And as director Harry Lynch assures us time and again throughout Ride Around the World, the American cowboy is not a relic of the past. Tagging along with the crew of Texas' 6666 ranch, we watch as modern cowhands move hundreds of steers across a 500 mile stretch, then put their brand on each one when the journey is complete. Even as far north as Alberta, Canada, the rich cowboy tradition lives on, and Ride Around the World, utilizing every inch of the enormous IMAX screen, follows these cowpokes as they continue an adventure that started in a far-off land many, many years ago. 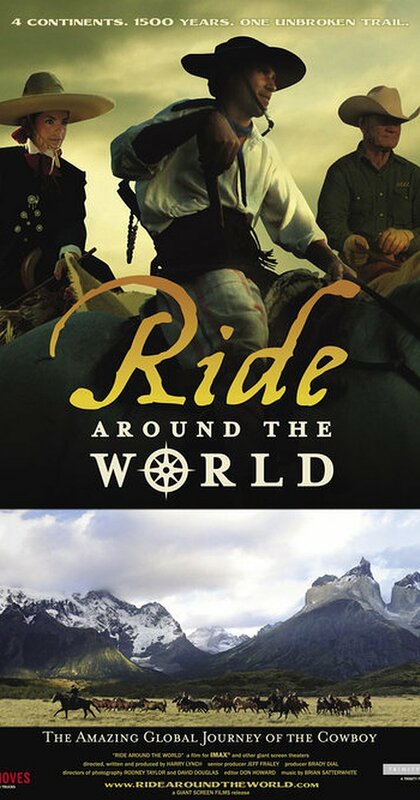 Packing a whole lot of info into its brief runtime, and with landscapes as beautiful as anything John Ford captured in She Wore a Yellow Ribbon and The Searchers, Ride around the World presents the true history of the cowboy, and, if you’re like me, it will be an eye-opening experience.